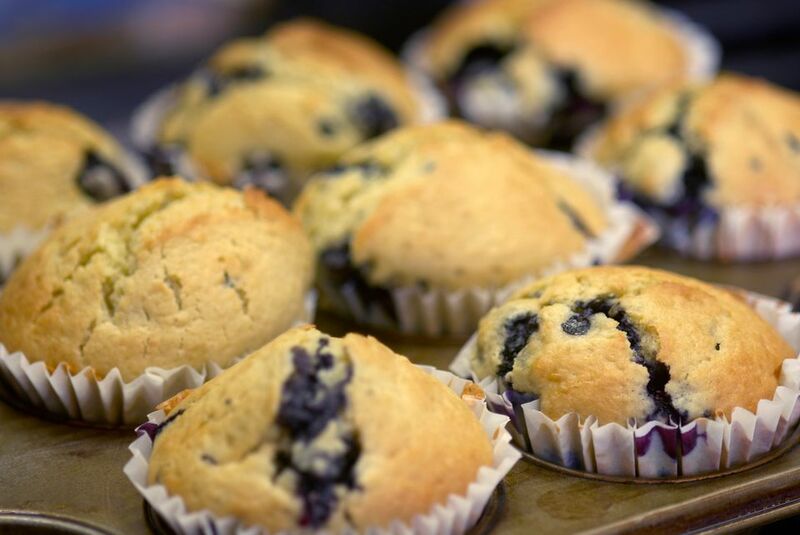 Blueberry muffins are the perfect addition to your weekend or holiday brunch, and they make a wonderful breakfast all on their own. You can make them with fresh or frozen blueberries, but if you use frozen ones, make sure you drain them well. A quick note about baking powder. People often ask why their muffins or other baked items don't rise as they expected, and the number-one reason is that they're using old baking powder. Baking powder loses most of its effectiveness after about six months, so if you've had yours in the pantry longer than that, do yourself a favor and replace it. The fresh stuff will really make a big difference in your muffins and cakes. For a lighter muffin, you can use 260 grams of pastry or cake flour instead of all-purpose flour. Or you could use a half all-purpose and half pastry or cake flour, so long as the total adds up to 260 grams. You can also substitute 3 tablespoons of oil for the butter if that's too rich for your taste. They'll be moister, but not as buttery. Then again, you can always split the warm muffins open and slather them with butter. And if you want to add another layer of flavor to the muffins, this easy cinnamon streusel topping might be just the thing. Combine the flour, baking powder, sugar and salt in a large bowl. In a separate bowl, beat the eggs and then add the milk and vanilla. Thoroughly grease and flour a 12-cup muffin pan (or insert paper muffin liners). Slowly pour the melted butter into the egg-vanilla-milk mixture, stirring briskly until all the butter is incorporated. Add the liquid ingredients to the dry ones and stir for 10 to 15 seconds. The batter will still have some lumps in it, but that's okay. If you overmix the batter, your muffins will turn out tough and rubbery. Using a rubber spatula, gently fold the blueberries into the batter. Then carefully spoon the batter into the prepared muffin pan (you can use a small ladle or even an ice-cream scoop) and bake immediately. Bake 18 to 20 minutes or until the muffins are slightly golden brown and a toothpick inserted into the center of a muffin comes out clean.